Yas Marina Circuit -- The 2018 Formula 1® calendar is off to a great start, and this year will see Yas Marina Circuit celebrate its tenth anniversary edition of the season-ending Abu Dhabi Grand Prix. 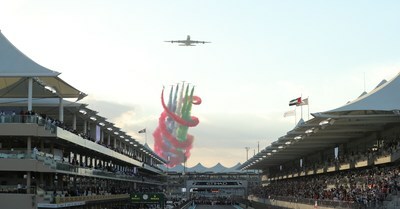 Since the inaugural race in 2009, organisers have continued to innovate and provide the very definition of a modern grand prix, borne out by the fact that 60 per cent of all ticket holders last year travelled from overseas to attend. Incorporating the theme of 'Swipe Up', this year will provide local, regional and international fans with all new layers and added value at the #AbuDhabiGP, providing more choice than ever before. Following Sunday's thrilling F1® curtain raiser in Melbourne that saw Sebastian Vettel battle it out with Lewis Hamilton, with the German ultimately triumphing, Yas Marina Circuit has announced that tickets are now on sale with 30 per cent discounts available for those who book before 31st May. Corporate clients will also be rewarded with discounts for early booking of the Circuit's revamped hospitality solutions available during race weekend. With the FORMULA 1 2018 ETIHAD AIRWAYS ABU DHABI GRAND PRIX on November 23-25 again the final fixture of the F1® season and marking its 10th anniversary, fans will not want to miss out on another fantastic weekend of entertainment both on and off the track. Al Tareq Al Ameri, CEO of Yas Marina Circuit, said: "Last year proved to be a very successful weekend for us, with 60 per cent of ticket holders coming to the Abu Dhabi Grand Prix from overseas. During our previous nine editions, we have built strong momentum and have set the standard for what an F1® weekend should be. This year, as we prepare for our milestone 10th grand prix, we look forward to our biggest and best race weekend ever and hope you will join us to help celebrate."